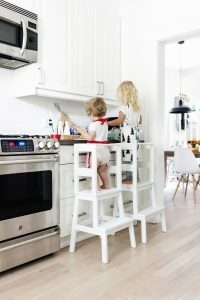 Helping a child become independent in the kitchen can be an exciting and daunting task all at once, especially once you realize how capable your child is! Below you will find five simple tips that you can implement in your home today to help your toddler or preschooler understand how to contribute to the family and take care of their needs independently. From a very young age, children understand when the work they have been asked to do is simply a distraction, and when it is an important contribution to their environment. 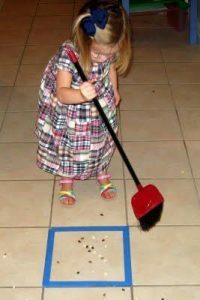 That is why in a Montessori classroom, children are given the opportunity to actually sweep and mop the floor, to make real food and to complete a large number of other tasks that allow them to directly care for their environment. You won’t find fake ovens, pretend vacuums or plastic food in our rooms. These children are capable and we give them the opportunity to show that capability on a daily basis. Luckily, with a little patience, this is a fairly easy adjustment to make at home! Simply find a way to make participation possible for your kids. Providing a child size broom and dust pan, placing towels in a location your child can access and mixing a non-toxic cleaning spray (vinegar and water works) all give your child the opportunity to help throughout the evening doing tasks that really assist you around the kitchen. Did you know… at school your child has the opportunity to participate in setting up for lunch? And (from the time they are in the toddler room) every child is expected to clean off their plate, pour their extra milk out and put all of their dishes in a bin after lunch and snack. Not only is this part of their every day routine, but if you ever get the chance to observe this transition it is amazing to witness how much pride the children take in cleaning up. 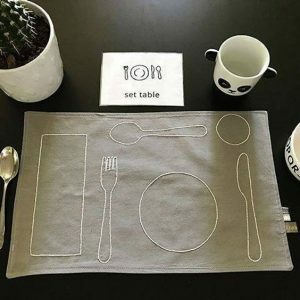 Modify this in your own home by letting your child help set out placemats, plates, cups and silverware before breakfast or dinner and let them scrape their plate into the garbage, rinse it off and put it into the dishwasher after the meal. They can obviously help with more or less depending on their age! If you have a picky eater, this is one of the best ways to overcome the dinner time arguments. Before the week begins, sit down with your child and ask what things they would like to grocery shop for. Help them create a list (suggesting healthier alternatives when appropriate) and write it down together. 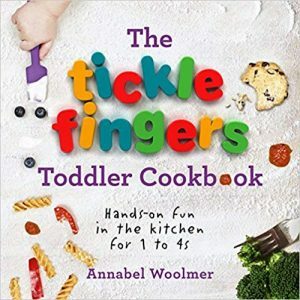 There are even some great toddler cookbooks that you can look through with them! Then at the grocery store, let them help you pick out the item and check it off the list. This is by no means a fool proof way to get your picky child to eat, but it will help them be involved in the process. Additionally, the more work they do to prepare the meal itself, the more likely they will be to sit down and partake in eating it. Ever get tired of your child asking for another snack? This tip allows your child some independence in choosing when they are hungry and what they want to eat, while giving you control over what foods they can choose and when. Setting up a small snack area in your kitchen takes a little daily prep in terms of setting out the snacks you want available to your child each day, but aside from that it is fairly easy to maintain. 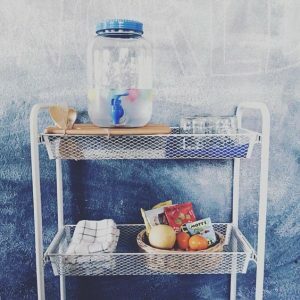 There are some amazing snack inspirations on Pinterest, but the basics involve including: a child sized water pitcher or jug and some cups, a few healthy snacks and child-sized plates, silverware and napkins. Make sure your child is able to open the snacks you have laid out for them or ensure you prep them before placing them out. Another tip is to use the Oxo good grip pop containers for snacks that will be out for a longer period of time, and use a whiteboard to write the numeral as well as draw a picture of how many scoops of the snack the child can have on a daily basis. This allows children to either count or read the number depending on their age. The last tip to creating a child friendly kitchen is to allow your kid access to the counter or sink. The best way to do this is with a kitchen helper! This is a tool that allows small children a means to reach areas that are normally only accessible for adults and opens up a world of opportunity for them. There are several options on where to purchase a kitchen helper, but there are also some great DIY tutorials for those who have some skill and want to save some money. To see a great example of what is possible with a kitchen helper, watch this incredible video of a toddler making coffee for his dad in the morning! Have another tip on how to make your kitchen more child friendly? Comment below to share with us! If you are interested in finding a daycare or preschool for your child and want to learn more about us, please don’t hesitate to reach out! We are happy to answer questions about our infant, toddler, preschool and kindergarten programs or set up a time for you to take a tour of one of our three beautiful Montessori campuses.